An example of just how desperate some local newspaper websites can get in attempting to create a story, check out the Birmingham Mail trying to promote actor Robert De Niro as an Aston Villa fan. There might have been a funny story in there, if the staff journalist actually had a funny bone in his body. Also, the BBC continues it’s reputation as being shocking when it comes to football facts and names. Now it seems they have another one…. Robert De Niro. The Godfather and Raging Bull actor was in London with Sylvester Stallone to promote their new film ‘Grudge Match’. They took part in the BBC’s weekly football prediction game with Mark Lawrenson and De Niro tipped Aston Villa to beat Arsenal at Villa Park. He also predicted Everton would beat Norwich 17-0 so don’t read too much into it! 1. So desperate was Steve Wollaston to create his link-bait headline, he didn’t care if there was any fact or a story behind it. Robert De Niro has not joined the list of Aston Villa famous fans, in fact he knows next to nothing about football. 2. Did Mr Wollaston even watch the footage of the Stallone and De Niro tongue-in-cheek stab at predicting the Premiership results? Yes, De Niro ‘tipped’ Villa to beat Arsenal, but he did not predict Everton to beat Norwich 17-0, that was Stallone, trying to win brownie points having visited Goodison Park a few years ago. 3. The way these things work is the film PR company behind ‘Grudge Match’ (which looks like a turkey to be fair) would have approached Football Focus with the angle – ‘football is a sport, so is boxing, we’ve got a stinker to promote, but we can give you two of the biggest names you’ve had on your little prediction thingy’ Football Focus has the perfect male demographic for the film, it’s all good. 4. Having spent over 10-years interviewing actors, including these two, I can tell you De Niro doesn’t normally do much press, as to put it bluntly, he’s got as much charisma in interviews as a broken Holte End toilet. Stallone, on the other hand, can play the game and is a willing and good value raconteur. They’ve done a bunch of press in the USA already for the film and De Niro has only done it due to Stallone being there to carry the load. The attempt at the comic duo act is a little clumsy as you can see in the video. You will also see, that De Niro clearly doesn’t give a f**k about the Villa (or know anything about football), making the Birmingham Mail article headline a blatant lie and the article’s attempt at being witty is even clumsier than Football Focus’s guest dynamic pundit duo. 2. See the last line. 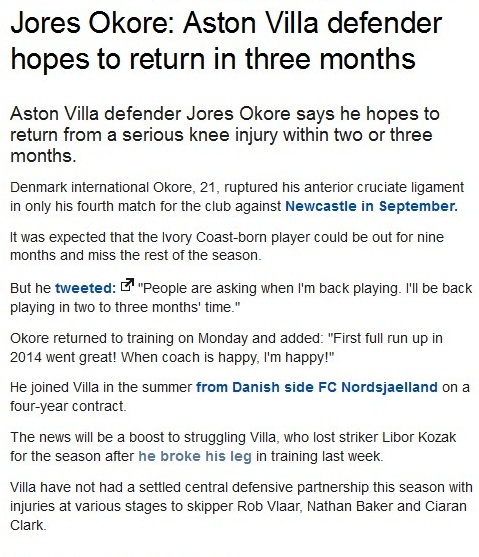 Who’s this Rob Vlaar chap? Does Ron have a brother that has slipped in under the radar as a January signing for Villa? We all make mistakes, but we all don’t have a team of subs that get paid for checking things. The problem is the BBC website is guilty of making frequent mistakes on the license payer’s dime. Are we nitpicking? Well, remember when they referred to Alex McLeish as the ‘Birmingham City boss’, while he was the manager of Villa? Ouch! f you’ve spotted an article that is just lazy journalism, or worse, and perfect for Media Muppets then leave the link in the comments below or send it to us via twitter.